The European Union (EU) is made of 45 different countries over an area of over 4 million sq. km. With 503 million inhabitants, it has the third largest population in the world after China and India. France is the largest country in the EU. Europe is also the global epicenter for art and literature a cradle of innovations. The EU has a 23 official languages and a multitude of cultures. The most widely spoken language in the EU is German, while 51% of adults can understand English. Several thousand Americans and nationals from other countries live in Europe. Virtually every country has a sizable community of expatriates, some of whom have been there for years. Cars are expensive in Europe so if you are considering shipping your car along with your household items then it might be a good idea. When picking up your car at the European port, you will need your original bill of lading, passport, auto title, insurance, driver’s license, International Driving Permit, a few liters of gasoline, and your keys. If you plan on moving major electrical appliances such as refrigerators, washing machines, dryers, ovens, and dishwashers then you will need a 220 to 110 step down transformer. For those shipping Televisions; a majority of the European countries use the PAL system. The countries using the PAL system include Belgium, Denmark, Finland, Germany, Great Britain, Holland, Ireland, Norway, Poland Sweden, Switzerland, and the United Kingdom. France uses the SECAM system. If you have an NTSC Television that you want to take with you to Europe then we recommend buying a NTSC to PAL converter. Following is a brief summary of key customs regulations in the UK related to personal effects and automobiles. Please check with customs authorties in respective European Union countries to learn more about customs regulations specific to each country. You can import used personal effects due to Transfer of Residency. To qualify for relief from duty, you should have lived outside the EC for period of 12 months or more, owned and used the items for at least 6 months and import items within one year of your arrival. Duty charges will be assessed for new items. You can import used motor vehicles. To qualify for relief from duty you should have lived outside the EC for at least 12 months, owned and used the vehicle for at least 6 months prior to import and import within one year of your arrival. You are required to provide evidence in the form of a vehicle title / registration document and, in some instances, copy of utility bills for the last 12 months maybe be required to ensure that duty relief can be fully gained. Duty and VAT will be assessed for any newly owned vehicles imported. You will be required to supply a copy of the purchase invoice and proof of the C.I.F value (Cost of Freight and Insurance). Duty and VAT charges may be assessed on both the value and the C.I.F. declared at the time of import. Any alcohol imported with unaccompanied used household goods are liable for duty and VAT assessment. Delays with customs release are quite common when alcohol duty assessments are applicable. Moving to Europe can be more complicated than moving across the country but that is where we step in at UniRelo and work with you to simplify your move to Europe. 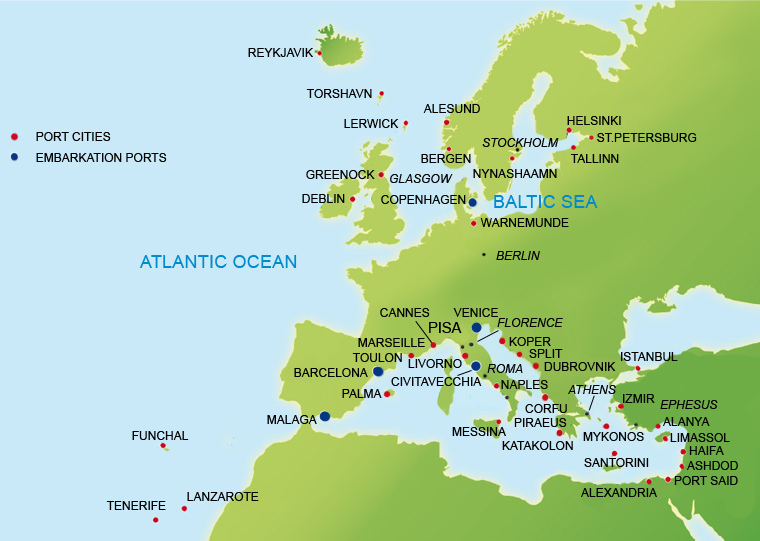 We ship to all major ports in The UK and European Union including Rotterdam, Antwerp, Hamburg, Marseille, Amsterdam, Felixstowe, Novorossyisk, Le Havre, Prymorsk, Bremen and Bergen. We are also able to undertake air freight shipments to all major airports in the UK and EU.